Cove 55 is an Internationally acclaimed luxury hotel & resort near Mt Santubong, Kuching. The hotel is committed to providing our guests a 5 star customer service and the highest levels of comfort and luxury. In 2018 the hotel re opened after extensive refurbishment and won two key international luxury hotel awards. 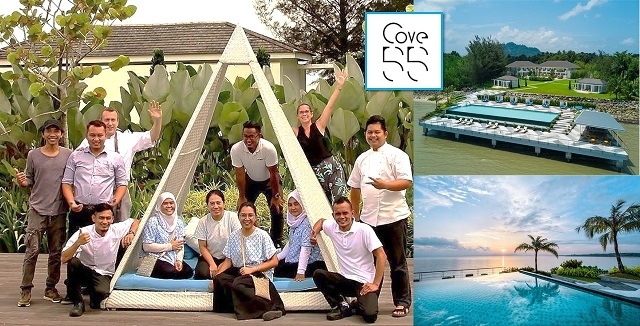 We value our team and promise our colleagues a warm welcome and will help you to feel part of our Cove 55 family from day one. We are dedicated to giving you every opportunity to excel in your role and you can rely on us to support you as you settle into your journey with us and make Cove 55 ‘Your Place to Shine’. Cove 55 are looking for a dynamic, talented & dedicated maintenance personal to join our award winning team. This is a unique opportunity for career development at the highest level in a boutique luxury property. The maintenance individual as an ambassador for Cove55 is required to actively promote the quality image of the hotel at every opportunity. You are responsible to provide professional service to our guests. Your role will include Assignments throughout the day on various shift patterns. It is of key importance to note that Cove55 is a small boutique property and thus it will be important and regularly required to perform duties outside of your job description as requested/required by the Resort Managers.